Clarence E. Larson (1909-1999) was an important pioneer in the field of atomic energy. After serving on the Manhattan Project during World War II, Larson became director at Oak Ridge National Laboratory, where he served from 1950 to 1955. He was an executive at Union Carbide. from 1955-1969 where he headed up the Nuclear Energy Division. 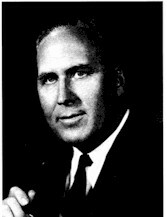 From 1969-1974 Dr. Larson was Chairman of the Atomic Energy Commission. He was the recipient of many awards and honors.